​is Roland's answer to half a decade of hard-to-program synthesizers. Covered in sliders that act as dedicated editors just like a classic analog synth, the JD-800 is an extremely programmable and hands-on digital synthesizer. It is also an interesting and great sounding digital synth with incredible flexibility and control. Internal ROM based waveforms are combined to build your sounds. The sounds are based on Roland's D-50, but updated for the nineties with multimode filters - uncommon but welcome at the time (source Vintage Synth Explorer). ​were recreated in Kontakt with the help of the Kontakt effects, filters and modulators. And with the addition of an arpeggiator, even more sound possibilities are available. An instruments exists out of two layers that can be switched on and off and edited seperately. Multis exist out of several Instruments combined together to get huge layered sounds. 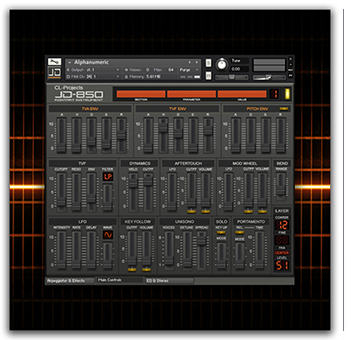 JD-850 is divided into 12 different sound categories, containig 200 instruments (nki's) and 50 multi's (nkm's). The sound categories are: Arpeggios, Atmospheric, Bass, Brass, Keys, Leads, Pads, Percussive, Plucked, Strings, Synths and Winds. ​is very clear and easy to understand and makes the sounds very tweakable and it encourages you to make your own. The Master Controls page lets you edit the Filter, Envelope and Modulator parameters for the two layers seperately. The Arpeggiator & Effects page contains the parameters of the Arpeggiator and the settings of 6 different effects including a convolution reverb with 21 different reverb effects. The last page is for editing the settings of two more effects, 3-Band EQ and Stereo Modeler. ​"This is a library from CL-Projects, based on sounds created with the Roland JD-800…which happens to be a synth that’s been on my own personal “watch list” for a while. So while I’m waiting to find the right deal on the hardware, I figured why not checkout this library? Let’s get into it! So what is JD-850? It’s a new library with a custom scripted interface for Kontakt made up of sounds that were created on the Roland JD-800. It’s digital style synth so think of pads, bells, keys, strings, bass, brass and more. The library itself has dual layer style patches, an arp, fx, and master eq for each patch. It’s not a Kontakt Player library so it requires the full version in order to use it…unless you plan to use Kontakt in demo mode for 30 minutes at a time. If you’ve ever been curious about the JD-800, or your just looking for some cool digital synth sounds, it may be worth taking a look at this. How does it sound though? Man…it has a really nice and airy sound to it. I wanted to check it out mainly for the pads, which are great, but there’s also some really good bell-ish tones, some nice keys, strings, a bunch of synth leads and other complex synth sounds. All the sounds definitely have that nice digital sheen to it, which, if you’re looking for that sound, you will definitely love. Digital synths have a certain quality to them when they are just doing their thing and it’s definitely a sound that many enjoy. The recordings were well done, the use of fx in the programming made the presets come alive and the way you can manipulate them on your own directly in the interface also adds to the joy you get from the sounds in this library. I like the dual layer setup, it would have been cool if we could actually go in and pick the layers ourselves, but even still, the sounds provided are great and very tweakable. So what’s the bottom line? I wanted to check this out for a specific reason and I was definitely pleased with what I heard The JD-850 is a really well recorded, programmed, and scripted library, I give it 4.5 out of 5 subs, anyone that is a fan of the actual synth will no doubt enjoy this library. It would have been cool to have a bit more bass, but of course the strength of this library lies in it’s melodic synths, pads, keys, and bell-ish tones. Of course if you like the brass that these types of synthesizers produce then you’ll find some patches for sure, though I would have liked to see a few more in the brass and wind sections. The blown bottle style patches are always cool :)"
Marius Schlossbauer: "FINALLY. I was looking for that early 90s ambient vibe,this thing nails it!" William Munnerlyn: "90'S. I use this on a few tracks and my clients were wowed I can't wait to buy my next item from you guys sounds are so clean." Rodrigo Basso: "REMEMBERING THE 90'S ERA. Finally Roland JD-800 samples I really miss those concept Easyest way to get a perfect sound as JD-800 did. Really awesome." Rick Handville: "JD 850 FOR KONTAKT IS VERY COOL. I've always wanted to own a Roland JD 800 and now I feel like I do using these samples for Kontakt. The programming is excellent particularly the MULTIS and the ARPEGGIO patches. Price was really reasonable also! Highly recommended." Ric Gregorio: "FANTASTIC KONTAKT LIBRARY. Very pleased with the overall sounds this library has to offer, the samples are warm and has life to it. Cl-Projects did a wonderful job creating this library - money well spent! the patches are very editable and fun to tweak to create my own user library. If you can create more Patrick O'Hearn style patches that would be great!" BEL - INCANDELA JLB - FAB: "JD-850 ET OUI, COMME UN GRAND! Tiré du fameux Roland JD-800 Il est vraiment bien samplé, avec 200 présets, il vous donne "presque" le son du vrai JD Oui, il sonne, il est gros et gras même si ce n'est pas un pur analogique. Pour qu'il sonne encore plus réel, ne mettez pas d'effet intégré ni de plug-ins, sortez le sur un mixer avec un effet externe Hardware (type Lexicon) et là il devient Terrible ! Bravo CL-Projects Et merci Kontakt Hub." Mio Michael Cramer: "THIS ONE IS (ALSO) GREAT - WORTH THE MONEY!" ​Peter Weis: "EASY AND INSPIRING TO USE. Great sampling and programming work on this. After purchasing I started flipping through the Instrument Patches and was inspired very quickly. Within minutes I had a new cue going. Using this felt very reminiscent of flipping through patches on real gear." Keith Chalker: "JD FAMILIER. A bit of a favourite I have the real thing but its great to have the convenience of the Kontakt set for multi incidents etc Character is right it cuts though a mix, when needed the way the original did Classy sound I'd recommend to any one." Wil Harris: "EXCELLENT! I have a few CL-Projects libraries and this one is no different....excellent!! The sound is superb as usual. This company never disappoints." Nigel Hooton: "WONDERFUL SOUNDS! This instrument is a joy to use and such a pleasure to listen to. The dynamic (velocity & aftertouch) and modulation controls provided are many and they really do work very well to alter the sound. The arpeggiator is great and features the "AS PLAYED" mode, that many other developers omit. Fully recommended." ​Daniele Pacciorini-Job: "JUST FANTASTIC. For the lovers of the iconic synt.h Sounds fantastic!" Marcos Ciscar: "PADS FROM A GREAT ERA! The pad-freak in me has always loved these synths from the 90s. Very well captured and great GUI. It filled a hole in my collection. Superb!" ​Andy Mollard: "NICE EMULATION AND THEN SOME. Great sound and great controls to tweak to your heart's content. Great synth!" ​Eric B: "Awesome.This excellent kontakt-based piece of software makes good on its promise to conjure up the sound of the 90s, especially the pads, some of which are downright organic and inspiring. If you're into new age or ambient, JD850 is for you. My only regret was not to found some of the famed JD800 sounds such as Massive Pad or IceMan. However, JD850 is worth every penny spent on it." ​Caesar G.: "Outstanding product! I love the sounds. The attention to detail is amazing. I will be a frequent visitor to your website. Thank you!!" ​Dino L.: "Increíble! De lo mejorcito que he oído. Es tocar una nota, y la inspiración brota! Muy buen sinte. (Amazing! The very best that I've heard. When playing a note, inspiration flows! Very good synth.)" Michael S.: "A Gem. The JD 800 needed software representation. This is it. I hope the author updates this with the remaining factory patches." Michael M.: "JD-850 Rocks. Very happy with this synth. Sound is rich & full. Patches are categorized logically and easy to find what you want. Once you get there its easy to tweak. A very good experience."